As you know Halloween is known for its overindulgence of sweets, crisps and chocolate. They are everywhere! So if you’re trying to lose weight during this time you might find yourself getting tempted. Today I want to share with you 10 healthy treats and snacks that you can have that will help to satisfy any cravings you’re having. These two go really well together. Slice up an apple, spread a bit of PB on each slice and you’re good to go! Mix a good handful of kale with a little olive oil and a pinch of seasoning. Spread out evenly on a baking tray and bake at around 170-180 degrees for approximately 15 minutes, or until they’re crisp. Snack on them plain or you could lightly toast them under the grill for a couple of minutes with a sprinkling of your favourite herbs and spices. Roasting chickpeas with some paprika and garlic will give them a nice, crispy texture. These are great to snack on and they’re full of protein. If you’re a fan of popcorn the best kind to get is the one that contains no salt or butter flavoring. Stick with good ol’ plain popcorn and adding spices to taste. These are great to snack on and give you an energy boost. There are lots of different variations you can try. Mix a cup of oats with approximately half a cup of peanut and add in some optional extras, such as honey, chia seeds, cinnamon, vanilla and raisins. Experiment and see what you like best. Get your hands on a small bar of some high quality dark chocolate with at least 70% cacao. But make sure to eat it in moderation. Jazz up your plain Greek yogurt by adding a drizzle of honey, some berries and some flaked almonds. Instead of using regular ice cream use yogurt. Top with nuts, fruit and seeds. Spoon about half a cup of cottage cheese into a bowl and top with some chopped nuts, such as almonds and a drizzle of honey. 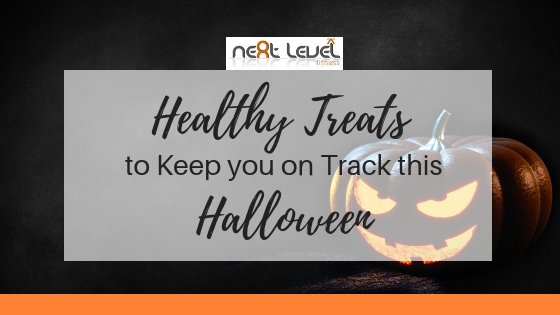 What healthy treats will you be having this Halloween?